The billing management system mechanism is dedicated to the collection and processing of usage data as it pertains to cloud provider accounting and cloud consumer billing. Specifically, the billing management system relies on pay-per-use monitors to gather runtime usage data that is stored in a repository that the system components then draw from for billing reporting and invoicing purposes (Figure 1). The billing management system allows for the definition of different pricing policies as well as custom pricing models on a per-cloud consumer and/or per-IT resource basis. Pricing models can vary from the traditional pay-per-use models to flat-rate or pay-per-allocation models, or combinations thereof. Billing arrangements can be based on pre-usage and post-usage payments. The latter type can include pre-defined limits or can be set up (with the mutual agreement of the cloud consumer) to allow for unlimited usage (and, consequently, no limit on subsequent billing). When limits are established, they are usually in the form of usage quotas. When quotas are exceeded, the billing management system can block further usage requests by cloud consumers. 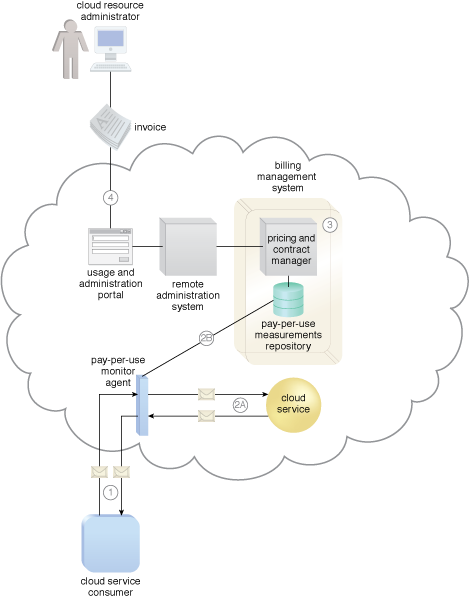 Figure 1 – A cloud service consumer exchanges messages with a cloud service (1). A pay-per-use monitor keeps track of the usage and collects data relevant to billing (2A), which is forwarded to a repository that is part of the billing management system (2B). The system periodically calculates the consolidated cloud service usage fees and generates an invoice for the cloud consumer (3). The invoice may be provided to the cloud consumer through the usage and administration portal (4).